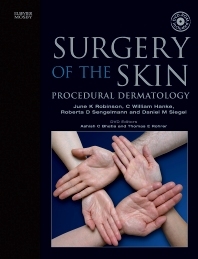 "Sets a new standard for future textbooks of dermatologic surgery." (JAAD, Feb 2006) Featuring the work of international experts, this resource uses a state-of-the-art, interactive approach to depict the art and practice of dermatologic surgery. Four separate sections sequentially cover the entire spectrum of skin surgery—from basic concepts and basic surgical procedures to aesthetic surgical procedures and special procedures. A bonus DVD-ROM features all of the artwork from the book, invaluable video clips covering both common and uncommon procedures—all from the surgeon's point of view. Includes a DVD-ROM featuring all of the text's artwork and invaluable video clips of common and uncommon procedures—all from the surgeon's point of view.